You couldn’t call it a conversation, exactly. More an exchange in two parts. 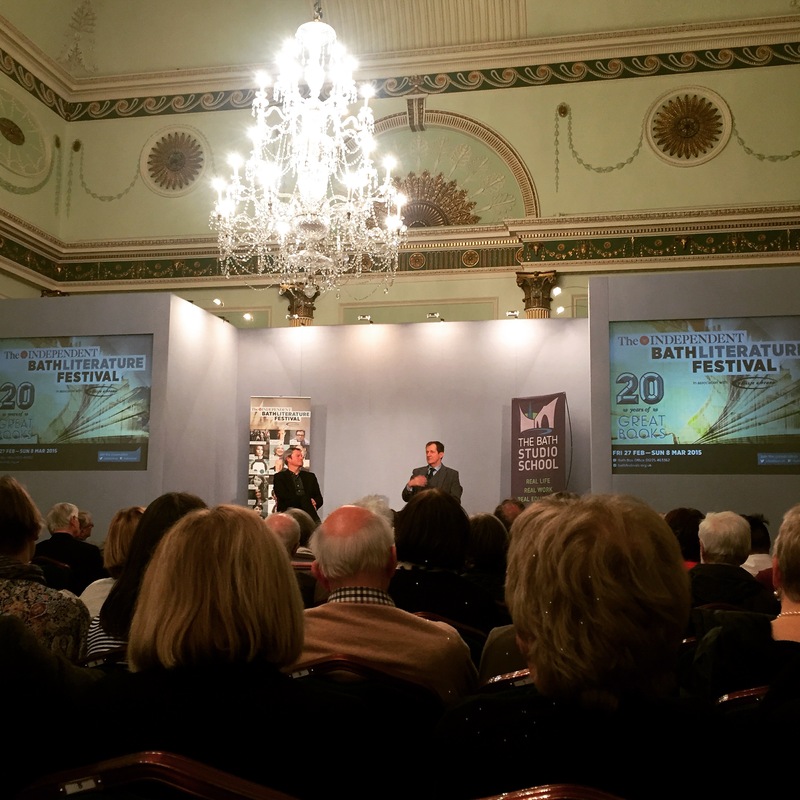 Part one was when I was one of an audience of a few hundred at the Guildhall in Bath, and I asked Alastair Campbell a question from the floor. 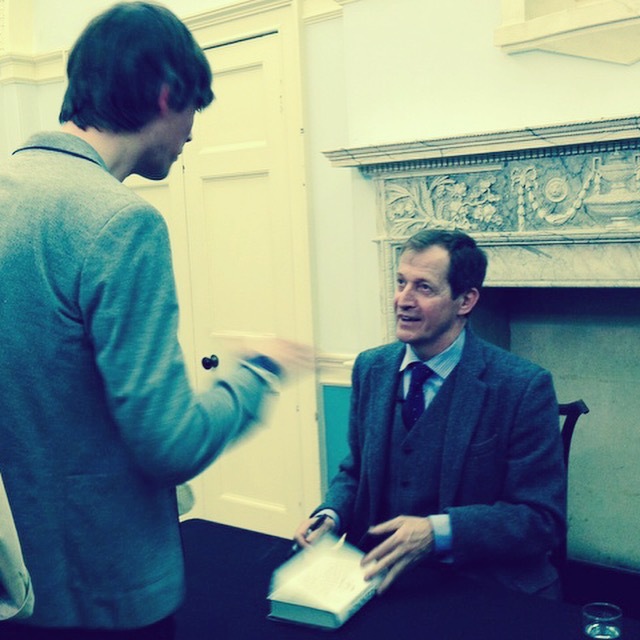 Part two was when I queued up to get a copy of his new book signed and he apologised for his “crap answer” to my question. And that looked like this. I laughed. His answer wasn’t crap. It wasn’t conclusive, but it certainly wasn’t crap. His book cover is, though, a bit. I don’t know if he would have laughed back. Except maybe he would. I reckon that cover is cheesy enough for me not to have bought the book had I only seen it in a shop. But I felt compelled to buy it once I’d heard him talk at the Bath Literary Festival. But as I paid for that too, Alastair Campbell has now taken my money twice for something I instinctively might not have wanted. I think he would laugh at that. I think he’d also call it winning. 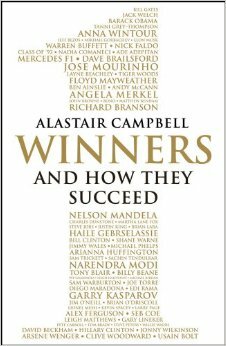 Alastair Campbell knows a lot about winning. He loves winning, and he loves winners. His new book – and its crap cover – is filled with them. In it he examines winners from different fields (mainly politics, business and sport) to see what they have in common and what we can learn from them. Campbell was a commanding and funny presence. You feel like you’re learning a lot – the power of some insightful anecdotes and a convincing way with words. Maybe that’s not surprising. He is a journalist and a storyteller after all. But one of the pleasures of knowing someone has the ability to charm and influence is allowing them to charm and influence you. So he not only wins, he wins you over. He’d been talking about what he sees as the fundamental element of winning, what he calls OST: Objective, Strategy, Tactics. A clear objective. A defined strategy. Tactics in line with each. So obvious it should barely be worth writing about. Now, time will tell whether the book hits the heights of Richard Rumelt, but for now, as a 30 second distillation of what I do each day, this is pretty damn good. I’ve been using the construct all week, on the fly and with others. It’s so simple and accessible. And as Dave Trott pointed out again this week people often ignore the simple solution. We are seduced by the most complicated solution available. Our tendency is to widen focus. A strategist’s job must be to reduce it. And to maintain that focus, continually. Even, or perhaps especially, when things change. My question to Campbell was about that moment of change. He’d said that part of leadership was the ability to adapt. What, then, is the difference between a wayward tactic and a smart adaption of strategy? And, how do we recognise which is which? He answered by contrasting two winners who see adaptability very differently. Gary Kasparov is a chess master. He says you should change strategy only if absolutely necessary. Of course, ‘absolutely necessary’ is a pretty mutable concept. But his point is that the strategy should be rigorous and good enough that it can withstand the onslaught for which it’s been prepared. Have faith in it, it should be good enough. But then he would say that. He’s a chess master. Jose Mourinho is a football manager. He devises a ‘tactical model’ for every match. The model is based on the premise that at any point in a football match there are very few options for what could happen next. If a goalkeeper has the ball, he can choose to roll it to a nearby player to left or the right or middle, or kick it long. If a team loses possession of the ball they will go forward or back. Every match that Mourinho’s teams play is planned to the extent that each player knows what to do at any of these moments. His teams are conditionally programmed. They’re like an 11 human IFTTTs. Mourinho’s view is that if the tactical model isn’t working then you need a new strategy. So he will shift models mid-match and get his team playing to a different set of variables. These are also programmed, and practised. The players just have to switch system. So Campbell answered my question by sharing the approaches of two very different winners. Each takes a different view of what constitutes strategy and tactics, but each shares an assumption that strategy cannot exist in theory or in isolation. It must plan for the unexpected. It must plan for change. A strategy is only as good as how it is crafted for the real world. I wrote recently about how a good strategy should account for the very human way in which it is to be executed. But equally, Campbell reminds us that strategy is never actually done. It can’t accommodate every eventuality. As well as being clear and decisive, it is also fluid, always becoming. Campbell highlighted the fuel crisis and the foot and mouth outbreak as examples when his own team underestimated the significance of unexpected events. The government thought these issues required a tactical response. As the events grew in duration, scale and intensity it became obvious that they represented a bigger shift. Something had changed in the discourse. A fresh evaluation of the strategy was needed. Perceiving the difference between adaption and distraction is not easy. Even Campbell got it wrong (on bigger things than foot and mouth too). It’s fuzzy. There’s no hard and fast rule. Maybe it just comes with experience. Perhaps that’s why his response to my question came in the form of two different case studies rather than a snappy sound bite. Perhaps that’s why he thought it was crap. But I don’t agree. I think it’s OK to be a little unsure. Because if strategy is fluid, we must be open to possibilities. And while we can be seduced by complexity, certainty can make us blind.